Headquartered in Marysville, Ohio, ScottsMiracle-Gro Company (NYSE: SMG) is the world’s largest marketer of branded consumer lawn and garden products. About ReedTMS Logistics Established in 2010, ReedTMS Logistics is an asset-based third-party logistics provider compromised of Reed Transport Services, Inc. and TMS Logistics, Inc. The two companies offer a wide array of transportation services to customers throughout the United States, Canada and Mexico. Headquartered in Tampa, Fla. with offices in Cedar Grove, Wisconsin and Ashland, Ohio. Founded in 1996, Reed Transport offers high-quality brokerage and freight management services. Founded in 1997, TMS Logistics is a multimode carrier specializing in dry van, dedicated fleet services. For more information, visit www.ReedTMS.com. This entry was posted in Trucking News and tagged 3pl, award, Carrier, excellence, logistics, Partnership, reedtms, ScottsMiracleGro, Tampa, transportation, trucking on October 30, 2017 by ReedTMS. 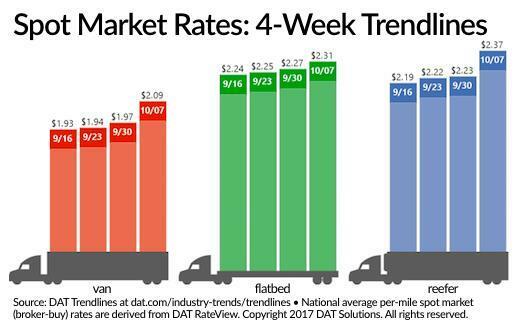 Spot truckload rates hit multi-year highs during the week ending Oct. 7, according to DAT Solutions and its network of load boards, as the number of available loads fell. The market for van freight remains solid despite a 6% decline in volume and 1% increase in truck posts last week, according to DAT. In Seattle and the Pacific Northwest, higher reefer load counts in the region contributed to tighter van capacity, meaning that fewer reefer trucks were competing for van loads. Rerouted port traffic from Houston to Seattle after Hurricane Harvey may have added to demand for trucks in the area. In the spot reefer market, both load posts and truck posts were unchanged from the previous week. The national average reefer rate moved higher due to seasonal demand and relief efforts following Hurricanes Irma and Harvey. The number of flatbed load posts dipped 1% and truck posts increased 6%, with rebuilding efforts in Florida and the Gulf Coast driving demand for flatbed capacity. This entry was posted in Trucking News and tagged dat, freight, rates, reedtms, reefers, trucking, van on October 16, 2017 by ReedTMS. Wall Street analysts expect truckload carriers to report mixed third-quarter earnings, despite a boost in business related to hurricanes Harvey and Irma. Six of the 16 publicly traded truckload carriers are expected to see 3Q profit growth, while three could have diminished returns, according to a Bloomberg News consensus analyst forecast. USA Truck is forecast to lose money for the seventh consecutive quarter, but will likely climb closer to the break-even mark than during any point of 2016. Celadon Group and Roadrunner Transportation Systems won’t report earnings, due to ongoing audits into financial discrepancies. Schneider and Daseke Inc. don’t have year-over-year comparisons available because they began trading on the New York Stock Exchange earlier this year. Patriot Transportation and PAM Transport Services have no industry analysts covering them. Werner Enterprises, which ranks No. 16 on the Transport Topics Top 100 list of the largest for-hire carriers in North America, is expected to have their second consecutive strong quarter. After growing profits 27% year over year in the second quarter, forecasts call for a 14% rise to $21.6 million in the third quarter. Earnings per share could rise a nickel year over year to 31 cents. 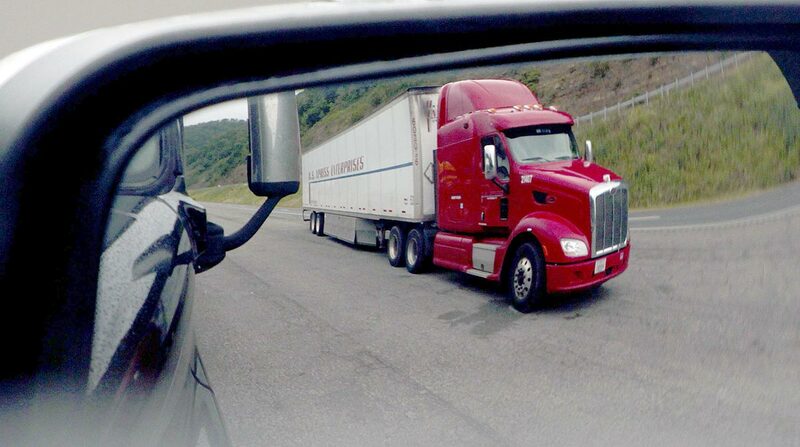 Conversely, the newly created Knight-Swift Transportation Holdings — the companies closed their merger on Sept. 8 — could announce that profits in the third quarter fell about 10% to $34.5 million or 33 cents, the analysts predict. The year-over-year comparison would be evaluated against the combined profits of the two companies one year ago. Swift and Knight rank Nos. 7 and 30, respectively, on the for-hire TT100. John Larkin, analyst at Stifel, Nicolaus and Co., noted that spot markets are up 15% and contract rates in the second half of the year were up 5% to 10% year over year, which will eventually spur earnings growth. For Epes Carriers Inc., revenue and operating income rose low-to-mid single digits versus last year, according to the company, based on data through August. The Greensboro, N.C., dry-van carrier ranks No. 81 on the for-hire TT100. “The past quarter has been very robust. We find ourselves in most areas most every day. And since the hurricanes, which was unfortunate for the country, things have picked up even more. We’re at a point where we’re extremely busy right now,” said Scott Fulton, ‎Epes senior vice president of sales. Big G Express president Randy Vernon said it’s been the busiest he’s seen conditions since late 2014. Vernon is re-approaching shippers for rate increases because he believes pricing hasn’t bounced back to 2015 levels, even after the latest capacity crunch. For Nussbaum Transportation, a dry-van carrier in Hudson, Ill., volume and revenue were up about 14%, which founder and CEO Brent Nussbaum credits to the strong economy. “Demand is up significantly from last year. Freight rates are up. Every industry we work with is up. This appears to be a result of housing, commercial construction, mining of commodities, business investment and consumer confidence [all] going up,” he said. Flatbed carriers in particular have capitalized on increased residential and commercial construction in 2017. The Institute for Supply Management manufacturing index climbed in July, August and September to 56.3, 58.8 and 60.8, respectively. During the same period last year, the numbers were 52.3, 49.4 and 51.7. A total above 50 is expansion and below 50 is contraction. Melton Truck Lines, based in Tulsa, Okla., reaped the rewards as revenue per truck per week rose 4.8% in the quarter. Business has not been as favorable in the refrigerated truckload market in 2017. Twin Falls, Idaho-based Giltner Inc., and Los Angeles-based White Arrow summarized the third quarter as flat. White Arrow CEO Chris Ceausu said per-mile rates were about the same as a year ago, while Giltner General Manager Mark Durfee described the last three months as marginal. This entry was posted in Trucking News and tagged 3pl, logistics, transport, trucking, truckload on October 13, 2017 by ReedTMS.